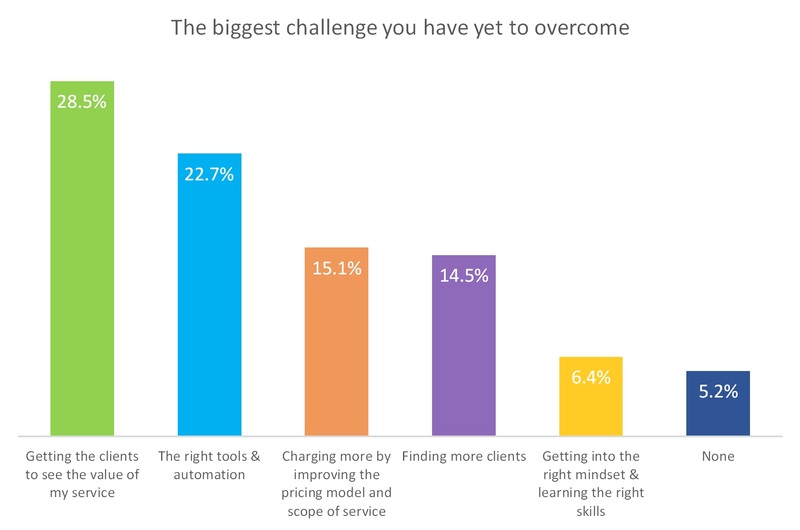 In the previous article about survey results we had the chance to find out why It’s great to have more than one tier of services to offer to your clients. And what’s best about it, is that it was based on the actual results provided by you, WordPress professionals. We couldn’t have done it without you! We received a lot of positive comments and decided to do a follow-up, giving you back some extra information and consolidating statistical data into practical, real-life, actionable insights. Here we go. As we move further into the digital age location is becoming a more and more ‘unimportant’ category in defining someone’s online business. More often than not clients find the location irrelevant when choosing their business partners (as long as you are at their disposal when they need you). However, most of those clients are connected to the ‘local’ or regional markets that are subject to all of the rules and economic factors that are specific to individual countries (average pay, cost of business, taxes, cost of living, etc). Therefore, we decided to present the data according to the location and to see what valuable information we can deduce from that. Since we had a lot of submissions from many countries we decided to group the results and deliver only the data that represented the ‘bulk’ of the entire set. We also decide to honor the exit of the UK from the European Union by giving them their own group category. It was a revelation to see that the WordPress maintenance services are valued so greatly in the US. 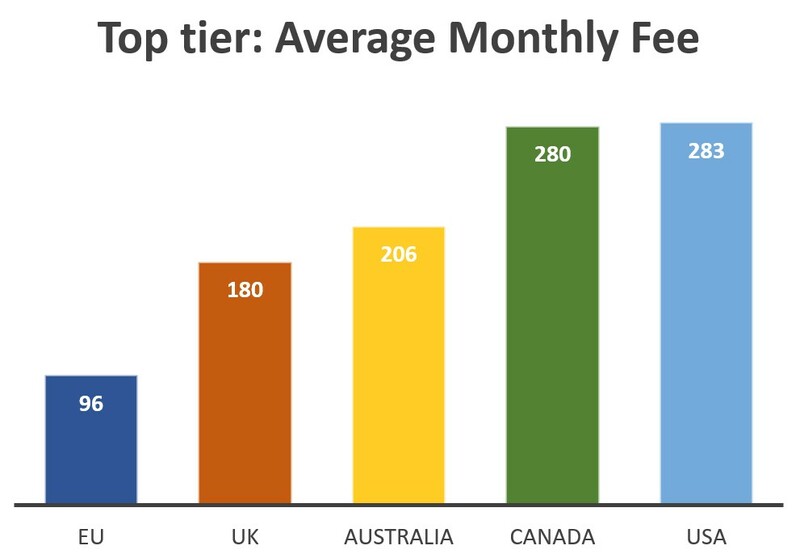 The average monthly fee for WordPress maintenance services in the US is nearly double compared to what is charged in other groups (Australia, EU & Canada) with the UK having the lowest average cost. We must emphasize here that the results from UK & EU are a bit lower compared to the other groups because they are (in most cases) shown without included taxes. While analyzing the results for multiple tiers, we found out that the results vary greatly so we decided to throw out a few of the ‘outliers’ as they are far away from the bulk of the other submissions and have a great impact on the final results. Here are somewhat ‘normalized’ results that give valuable information about average monthly fees in Top and Bottom tiers respectively. As we can clearly see the EU has the lowest rates for WordPress services in both categories, while US and Canada keep their top spots. We can conclude that in the US and Canada WordPress & IT professionals are highly valued, and while such trends are somewhat transferred to the UK & Australia, it is definitely not so widespread in the EU and the rest of the world. It definitely pays off to have US/Canada based clients. We also wanted to dig a little deeper into the value of each service offered, so we analyzed the monthly fee, distributed it for each offered service and finally displayed the results in a way that was easy to ‘read’. Even in the single tier service systems, it is obvious that the most valued services are Performance optimization ($11.34) and Development hours ($11.20). While they are not the most commonly used services (44% of the clients pay for Performance optimization & only 16% for Development hours), they are obviously considered premium value services and paid accordingly. Updates, Backups and Security are used almost by 91% of all clients and as such make the bulk of the value of all the services. We could even add the Uptime monitoring to this group as it is the 4th most commonly chosen service. What is surprising, is that services such as SEO, Malware cleanup and Content creation hold rather high value, despite the fact they are used by only 30% of the clients. Hosting is used by 36% of the clients, which tells us that more than a ⅓ of the clients completely delegates website management to the professionals – but as a service it holds a rather low value. License management and Code reviews hold the lowest value as a service and they are equally rarely used. As expected, in the bottom tier results we see that the most used services are those connected to the ‘core’ (updates, backups & security). However we can also see that precisely because of this segmentation, there is a much greater value for those rarely used services. Basically this means that the core services are valued, but in those rare instances when clients choose other services (Performance optimization, SEO, Content, etc.) they are much more expensive that in the case with single tier services. If you look at the results you will undoubtedly see that the least valuable services are those connected to the core maintenance services (updates, backups, security & monitoring). The bulk of the value of the entire results comes from the fact that the clients are paying much more for “top tier services” leading to top values for those individual services that is also reflected to the ‘included’ core services, taking the entire pricing system several categories higher that it is the case with single & bottom tier setups. If we take a look at the following graph, that shows average value of services and their adoption for all the tiers combined, we can clearly see that the largest room for improvement (the gap between the value and the usage) is with the middle and high tier services. Updates, backups, security and uptime monitoring could be considered as a core website maintenance service and should be offered to clients as such. 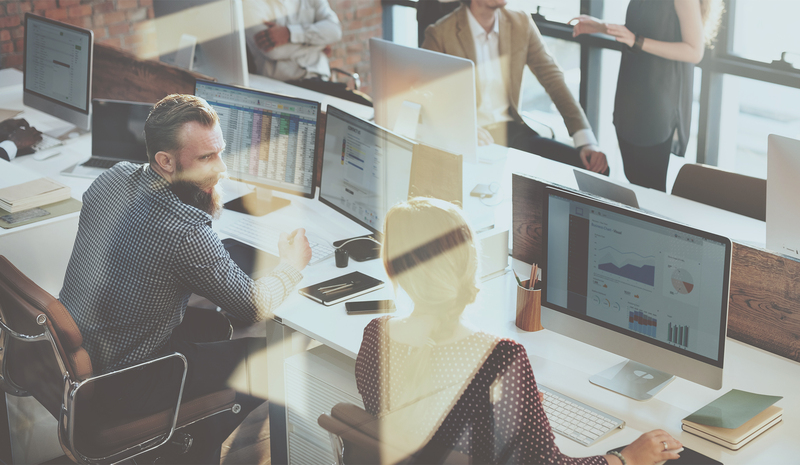 Performance optimization, SEO and malware cleanup could be considered as separate groups of potentially valuable services offered to clients as addition to the ‘maintenance part’ of the available services. And top tier should be reserved for services such as Content creation, Development hours, License management and other specific services that include special development or ‘custom’ jobs for the clients. “Clients are more inclined to pay you higher fees if you improve their websites & businesses instead of just maintaining them.” – N.A. How does this help me improve my business? Well, I’m glad that ‘you’ asked. Focusing our results around the question: “What’s the biggest challenge you still haven’t overcome?”, we will try to find the best answers and turn these problems into opportunities. Don’t try to ‘justify the cost’ of services. Focus on pointing out the value they provide. Segmenting the services into tiers may help you to more clearly convey to your clients the “difficulty” and the amount of work needed for separate services. Consider attracting new clients from locations where such services are valued higher, for example US or Canada. Setup a multi-tier system of services as it will give you an opportunity to ‘nudge’ you client toward higher tiers and also set the stage for those higher tier service as something more valuable. Low tier services should be the one that (with the right tools and automation) take the least of your time and are focused on maintenance & security. Middle tier services should focus on optimization and improvement. High tier should focus on clients that are prepared to pay the premium for the top quality custom jobs & developments. Right automation tools can free up a lot of your time, giving you space for additional clients or simply more time to enjoy yourself. Here we can wholeheartedly recommend ManageWP as your ‘weapon of choice’. It may also give you insights into how can you structure your tier system and how can you present the higher value of ‘premium’ services. As always, getting into the right mindset or good old “know-how” is the most valuable and most elusive of skills. Business results such as these or detailed case studies are great fountains of knowledge. However, the best advice that we can offer is to learn from those with more experience or attend some great trainings and webinars (such as those that our friends at WP Elevation offer) as it will give you practical knowledge about how you should structure/restructure your approach to business. Here are the results from the survey. Let us know how you are tackling the issues from above, and just make sure to link back to this article is you publish anything. We are looking to do more surveys, and haven’t settled on a topic for the next one so all suggestions are welcome. Leave a comment or email us with your ideas. Thank you! Next blogpost:What Type of WordPress Hosting is Best for Me? This data and the insights you drew are phenomenal! I’m looking to grow our maintenance services (for which we use ManageWP), so a couple days ago I started doing research. I’m so glad I found this post, because it answered many questions I had about how to structure tiers and how to price. Thank you so much! This is an excellent article, thanks for sharing this insightful information. I have very recently moved away from WordPress design and am focusing purely on support plans. I would like to know if there is any advice you can give in terms of gaining exposure in the marketplace? We posted an article recently that I think you will find particularly interesting: Recurring Revenue With Website Care Plans. I think it will provide some insightful advice (and some answers) as it is directly connected to the theme of website care plans. There is a quite a number of different services and plugins that can help you automate tasks that are essential for website maintenance, thus saving you precious hours of your time. And that’s why we are still committed to improving it and adding new features that can help you to further automate the tasks and even communication with your clients (https://managewp.com/automated-performance-check-is-live). A dubious honour. The majority of workers in digital occupations, voted to stay in the EU! Intriguing to see Australian fees are higher. Having worked in both the UK and Australia, that surprises me. I shall adjust my fees accordingly. You’re absolutely right about the lower tier services, and they’re the ones that can use up most of your time if you’re not efficiently automating tasks. We were half joking/half being serious with that statement. 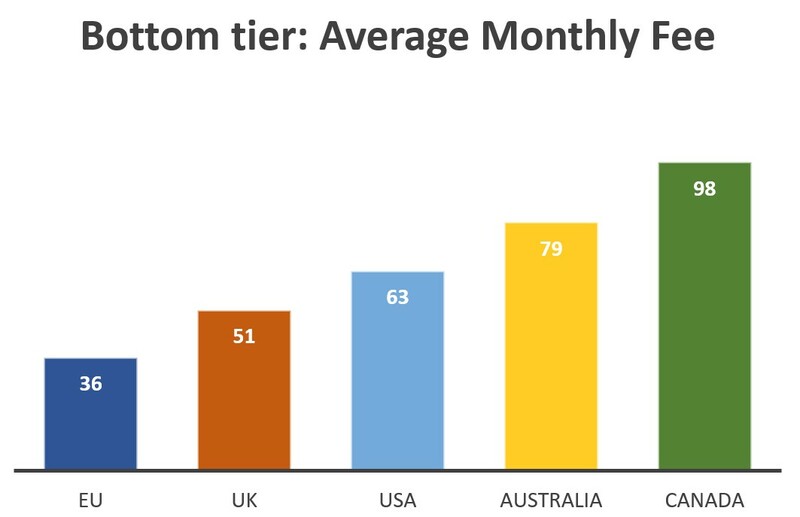 Joking part set aside, it allowed the UK to shine a little brighter since the most of the EU monthly average fees are lower than the corresponding UK results. Especially when multiple tiers came into play. 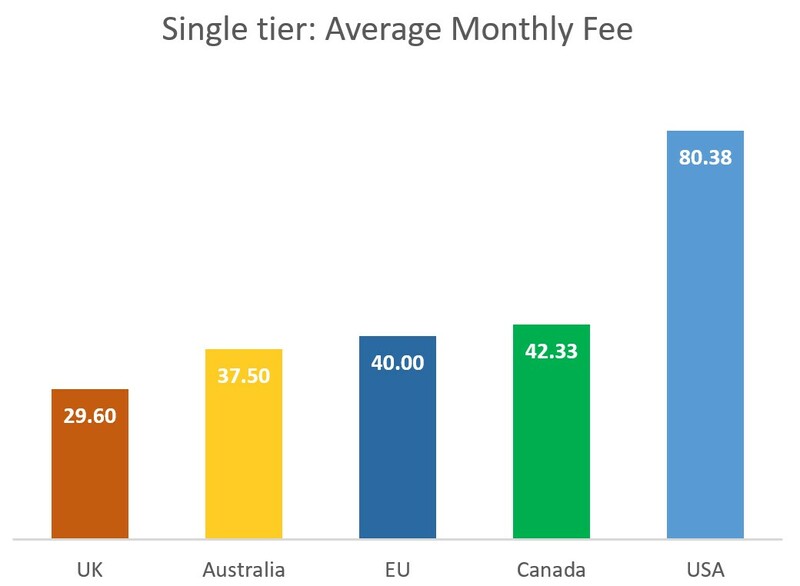 Australian fees are higher on average but they also vary greatly. From quite low monthly fees to quite large sums. There are quite a few high paying clients from the Australia, but not so much higher that they would be considered as outliers. UK fees, on the other hand, steadily hold their high value across the board. And last but not the least, as we mentioned in the article, the value for UK & EU fees is a bit lower than the ‘real’ values, because VAT was deducted from the results. For me it just hard to get business to care about the Maintenance of their website. Question I have always had my clients write their content now they want me to do it how do I go about the process of doing it. Sadly, a lot of business don’t realize the value of proper maintenance until there is a problem. I know quite a few companies that were unwilling to pay for the regular service, backups and maintenance only to be more than willing to pay hundreds, even a thousands of dollars to get their websites up and running. That is why it is up to us to properly present them with potential risks and the solutions. About the Content writing. First and foremost, you should not do it for free. Period. The only question is what kind of content do they want you to write. If it is the static content about their business – they really should write it themselves since no one knows their business better than they do. If it is a question of new content please take note that, according to survey results, content creation is the most valuable service. You might wanna make a deal to be paid per created article, or come to the agreement for a monthly fee for an agreed number of articles. In both cases, we strongly advise that you clearly convey that this is an upgrade from your regular services and should be adequately charged as such. Agreed, WordPress security management is an essential offering every web designer should be offering along with their design skills. I appreciate your analysis of some pretty complex data here – I’m a USA based WordPress designer, and I offer hosting and maintenance plans, but I haven’t always done so. I think the hardest part for me is transitioning from only offering cheaper hosting-only fees to more expensive, more robust services. I’d like to require all future clients to subscribe to my Website Care plans, but it’s hard to break the habit of letting them pay much less for hosting with me, where I’m still responsible for updates, backups and security. Side-note: you’ve misspelled “Maintenance” in the title of the post. Hi Gregg and thank you for your comments. I am glad you liked it. Hope that with these data-driven facts you have enough information at your disposal to help you improve your current plans, and hopefully, charge more-for-more for your services. Let us know what other insights you would find potentially valuable. P.S. Big Tnx for your side-note. I had it corrected after your comment. Your comment resonated with me on different levels. I am curious to know where you are at now – with the transition i.e. Has your situation changed for the better? What have you done differently since then? Appreciate your time answering this.